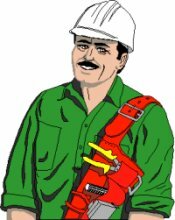 Article Summary: Want to bargain with your local contractor? 5 insights which will help you to get a huge discount on contractor fees. Contractor fees are not cheap and finding the best deals on labor takes patience and persistence. Unlike products available in the market, which we feel and evaluate before buying, contractors sell a service which is intangible and therefore it is difficult to compare contractors solely by their price quotes unless they are reputable. There are, however certain tips and tricks you can use to get contractors to discount their prices heavily for the privilege of getting your job. When a new company is started they are badly on lookout for work. If you do your homework you can save substantial contractor fees. Many of these contractors are skilled and have a long experience working under other contractors. It’s just that they are new to owning their own business and are looking to build its reputation. What to do in homework? Make sure the business is licensed and is insured. If possible ask someone who may have used their services in the past. Trust is another factor which you can rely on .Speak to the owner and follow your gut! Contractor’s workflow fluctuates with the seasons and swing in the economy. Make use of it to get the best prices on your projects. December and January are generally slump months for contractors. People are still recovering from holiday season and the cold often does not permit all kinds of construction. You could save substantial fees in these months. Avoid March, April and May because of the rush. Another good window of opportunity is during July and August. Many people holiday during the season and the oppressive heat makes contractor favor indoor projects. Don’t think you cannot negotiate with contractors. Their dealings are just like any other human business transactions. Contractors do build a buffer on their prices so that they can negotiate. As a general rule many contractors (not all) add 5% to their quotes. If you have a $20,000 remodeling project, a 5 % saving can be awesome! Try and ask, most homeowners never even try. If a contractor has slack of work he would be willing to lower his fees. A reference job is a project that a contractor can show to his prospective customers. If appointments can be scheduled with the homeowners of completed jobs, it can help close more sales for him. Reference works are pretty hard to come by for contractors. If you agree to act as a reference work you can benefit in two ways: Firstly you can negotiate a lower price and secondly you can be assured the contractor would give in his best. After all his future sales are at stake! All contractors are on lookout for fill in works. What are fill in works? These are projects which they can do when circumstances prohibit them from doing regularly scheduled work. For example if a contractor has a project to install flooring on an outdoor kitchen , he may be unable to do so because of heavy rains or because stamped concrete tiles of a particular color are unavailable at the local store. He may lose money if he sits idle. If he during that time can install flooring on another indoor kitchen project, he may be able to utilize his time. Since fill-in jobs are valuable to contractors you can often negotiate for a lower price if you are willing to allow your work to be a fill-in job. However make note that fill in jobs are not suitable for all kinds of remodeling jobs. They work best when the project completion does not have a direct impact on you. Therefore flooring the backyard can be a good fill in project but kitchen remodeling may become bothersome as you would need the kitchen as soon as possible.